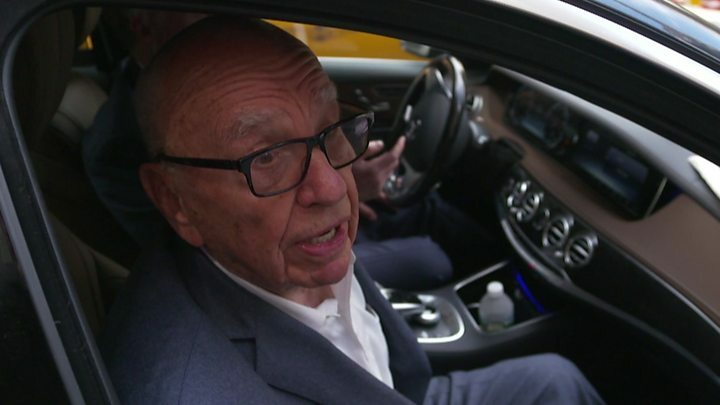 As Ofcom explores whether Rupert Murdoch's 21st Century Fox should be allowed to press on with its planned takeover of Sky, we thought the company might agree to an interview with the BBC. But they said no. 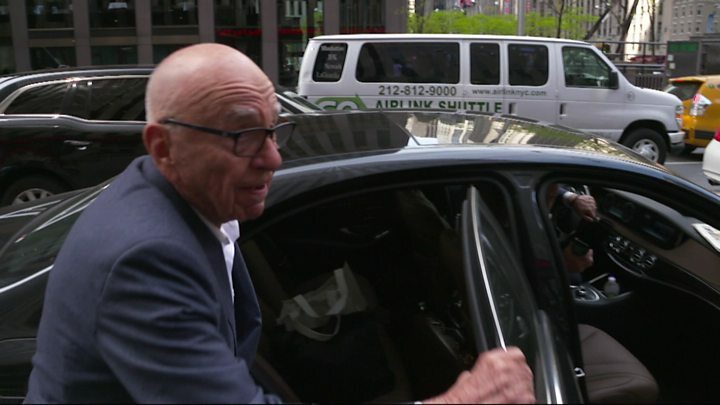 So we paid Rupert Murdoch a surprise visit at his headquarters in Manhattan. Outside the Fox News building, I asked him if he was worried about whether Ofcom would take a close interest in what's happening at his cable news network as it made its decision. First he waved a finger at me and responded: "You should be worried about what's happening at the BBC." But once inside his car, he clarified: "Nothing's happening at Fox News. Nothing." Murdoch's claim that there was nothing going on at Fox News, (aside from the "record ratings" he was very keen to mention) put me in mind of the wonderful Monty Python sketch about what the Romans have ever done for us. Alas I didn't have time to engage him more fully, but I suppose I could have said that - aside from the departures of the founder and chief executive, and the most high-profile and popular host on the channel, and the co-president who was a senior figure for decades - then, yes, nothing's happening at Fox News. Except of course, for the 20-plus legal actions that are now lodged against Fox News, from former employees claiming to be victims of racial and sexual harassment. Oh, and the internal investigation by legal firm Paul, Weiss, which unearthed such things as caused the aforementioned senior figures to depart. The allegations against O'Reilly and Ailes are strongly denied by them, and there are no allegations against Bill Shine. So apart from all that, yes I suppose there is nothing going on at Fox News. Oh, but forgive me - there's also the federal investigation into whether or not they concealed from investors the details of settlement payments for alleged harassment. Apart, then, from the departures of Roger Ailes, Bill O'Reilly, and Bill Shine, the federal investigation, an internal investigation, dozens of claims of sexual or racial harassment, an advertising boycott following the New York Times's brilliant investigation into O'Reilly, and a month of terrible headlines, I suppose it is true to say that "nothing's happening at Fox News. Nothing." As for the instinctive threat that it's the BBC that should be worried, I blame myself for this. Instead of saying "Amol Rajan, BBC News", I should have said - channelling my inner Troy McClure - "You may remember, Rupert, we first met at Barry Diller's garden party in Los Angeles during Oscars weekend in 2015, but then Graydon Carter sauntered over to say hi with Anjelica Houston, and I just couldn't compete." I can't blame Mr Murdoch: faced with a choice between speaking to myself, or Graydon Carter and Anjelica Houston, I would definitely have chosen the latter option. No wonder I didn't leave much of an impression. Had I done so, perhaps we could have conversed like old pals. Instead, Mr Murdoch simply told me that he was "not worried at all" about what's happening. But his family and company's long-standing desire to take full control of Sky makes the timing of this scandal, and the series of visitors to Ofcom, rather annoying. That's not to say that Ofcom will indeed rule against the latest bid for full control of Sky. There is, after all, a strong response from 21st Century Fox. In several conversations in Manhattan with those following this story closely, including representatives of Fox, the message comes back loud and clear, even if it is contradicted by Mr Murdoch's comment to me. That message is that Fox has taken swift and decisive action; that the allegations remain unproven; that there is so much more to Fox than Rupert Murdoch; and that the generational change now under way is harbinger of a very different corporate culture. Even if all that is true - and of course there are many who say it is rubbish - the man at the top was not on message when I spoke to him as he left work, doubtless to the annoyance of those trying to maintain message discipline on this ever-spreading scandal. Douglas Wigdor, the lawyer representing more than 20 of the individuals who have launched cases against Fox, told me that Fox only got rid of O'Reilly because of the looming Ofcom scrutiny and because the advertising boycott was hurting them financially. Fox vigorously denies these claims. The trouble for the company is that, on Thursday, Wigdor is going to spend rather a long time in the inner sanctum of Ofcom providing the kind of detail that cannot be good news for the Murdochs' latest bid.